Among the first on the specialty coffee scene in Shanghai were Cafe del Volcan. They are still going strong and while the cafe is tiny they have a large business selling the roasted beans to other cafes and businesses. The cafe has only a few seats indoors and two tables outside so in total it can seat around 10 people. There is a large selection of different coffee beans to choose from and there is a choice of having it either hot or cold. Of course there is also the option of espresso based beverages. The coffee quality here is in general high but not reaching the top international quality level. As in most places I have tried in Shanghai the roast is slightly to dark and while the quality is good they are still clearly not among the top ones in the world (in my world I am then talking of the likes of Heart, Tim Wendelboe, Roots and perhaps JB) but still doing an admirable job. The Kenyan filter was excellent, especially iced but the Guatemalan and Ethiopian ones were good but not top notch. What I found very interesting was that they seem very adapt at making the coffee taste great with the beans they have. I did buy some beans with me and I did not come anywhere near producing the same results as they did – when I made it at home it was not good at all. It may of course have something to do with my skills but in general I am fairly good at making coffee and I tried it as Aeropress, Chemex, V60, Gold Filter, Clever and on a regular Mocca Master and while it came out decent with some methods it was still not as good as the cup I had at the cafe. So the staff are perhaps better than the quality of the beans. Food is non existent but there are a few cookies on sale but for those hungry this is not the place. The service was as I have almost come to expect in Shanghai specialty coffee places excellent and very friendly. They made sure we got proper information on the coffees, were happy to chat and also made sure that we knew that they were cleaning the espresso machine on arrival so it would 5-10 minutes before they could make espresso based beverages. They also offer free wifi but since the place is small it is not inviting to stay for too long. It is Monday again and time for a coffee related post here on the winecurious. I am however also introducing some news: having realized that we have so much coffee related things to post on we are also launching a seperate blog for that so head to the The Coffee Curious to see what is going there. The coffee Monday posts will appear on both blogs but in addition there will be a lot of other coffee stuff on the Coffee Curious. In the Tianzifang market complex that is a huge mess of different touristy shops selling various levels of useless gadgets, art, design stuff and other stuff there are also some restaurants and cafes. Most if not all are severely overpriced but we still decided to try Cafe Dan as they brand themselves as a specialty coffee bar, wine bar, restaurant and coffee roasting institute. The food is however much better, it is more of a restaurant actually. The food is both decent value and good so would perhaps return for that instead of the coffee. Service was friendly, albeit a bit lacking in speed and English. That was perhaps not a big issue as the menu was still easy to understand and use (it was provided on an ipad). Free wifi was available and the place was rather nice to sit around in, spread over three floors and with a small outdoor terrace this place is a place that it would be possible to spend some time in. Our recent travels have taken us to Shanghai and even in a country where tea is the ruling drink there is some decent coffee. Most of the coffee here verges on undrinkable so I was almost set on just having the coffee I brought with me. After doing some research I did however find some promising places. The first on my list was the mini-chain of Seesaw Coffee. From what I gathered online they had three branches but when stepping into the one at the Réel mall the staff informed me that they now have five locations. The location at Réel is on the fifth floor is often, as often is the case with upper floors in malls in Shanghai, calm and surprisingly empty. They have succeeded in making the cafe feel fairly cozy and nice despite being in a mall. They fit well with the shops on the fifth floor as well as there are several stores selling small design accessories and such there as well. Looking at the coffee they serve an impressive array of different beans, when I visited there were six different beans to select from for hand brews. One could also select the method and they also offered three coffees as cold drips and of course espresso based beverages (two different blends to choose from). 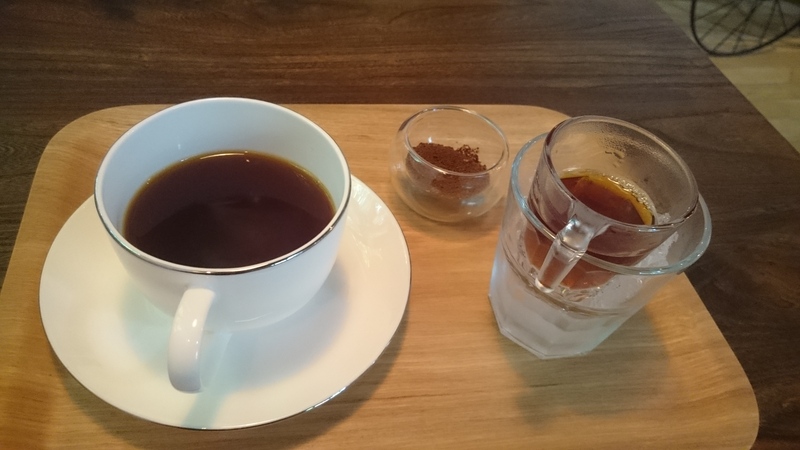 I have on different occasions sampled three of the beans made as filter (V60), some cold drip as well as espresso based coffees. The quality is consistent and while not world class they are very adapt at making coffee. The Ethiopian was the best I tried, while the Kenyan was slightly to dark and the Yunnan coffee more interesting than great. The cappuccino was very good and the Panama cold drip was also pleasant. They roast their own beans (at another location close to Jinan Temple) and the roasting is done fairly well but I would prefer it slightly lighter as I believe the main improvement in the quality would be if they picked up the roasting quality level a bit they would be even better. The food selection is very limited, basically no proper food just pastries. For those who do not like cheesecake the selection is meager (it can vary from nothing to one or two different cookies). For the lover of cheesecakes it is however great, usually a large range of them and very good ones. I am not really a fan (of cheesecake) but some of them are really excellent. Service was very friendly, eager to show the selection and while English was not superb it was good enough for us to communicate and get a lot of information on the coffee. There is free wifi but as often is the case in China it is a bit slow and a lot of services such as Google, Facebook, twitter and others are not accessible, still it is possible to sit and slack and lounge. All in all a very good place (perhaps the best) in a city that has an average quality of coffee almost as bad as in Italy. This coffee Monday I turn to my home town of Stockholm and one of the most celebrated coffee bars in town, Drop Coffee. They are located just by the tube station Mariatorget in Stockholm, around 100 meters from Johan & Nyström the really early ones on the speciality coffee scene in Sweden and who, at least in my view, have done more for speciality coffee than anyone else. This used to be the real cluster to come to for high quality coffee and since both these places are still here it continues to be a good place to sample some of the third wave of coffee in Sweden. Drop coffee started out as a cafe that served coffee from a variety of micro roasters from around the Nordic countries and that is how they built a reputation for serving excellent coffee. After a few years they did however decide to start roasting themselves and these days they only serve their own roasted coffee. They usually have between four and six different filter coffees to choose from and they are all hand-brewed. There is of course also espresso based beverages available. All the hand brews are made as pour-overs and that is of course a bit more difficult to get consistent quality with compared to for example the Aeropress. That really shows here as the quality of the coffee can vary greatly depending on who is working, how busy they are and just plain how much effort they put into it. I have noticed that chatting about coffee a bit first in general results in a better cup as they realize that you are actually interested. The espresso based beverages have actually been more consistent, which is a bit surprising. S is usually the ordering a latte and she is happy with the quality but the size of the latte is a joke, it is more like half a cup of coffee. As you can hear I am not ecstatic but they are still good but the quality has in general deteriorated during the past years but I have noticed that they are once again picking it up in the past 6 months or so. They are however not good enough to compete with the best in Stockholm but it is well worth a visit. They do serve some nice sandwiches, pastries and toasted sandwiches as well as soup. The food is in general high quality and while not a full meal there are good options for breakfast, brunch and light lunches as well as some nice options for sweets, including ice cream in the spring and summer. The service is in general friendly, often a bit slow and there is occasional confusion with forgotten orders and such. That said the friendly and relaxed attitude makes it feel as if it is ok. That vibe from the staff also translates to the place itself, it feels relaxed, people are friendly and it feels totally fine to sit there and slack for a longer period of time. The free wifi also mean that a lot of people sit around with pads and computers and I have not once heard any complaints about it. Despite people sitting for long and the place being popular it is still often possible to find a spot. So all in all not the top of the list for Stockholm but a good solid option, not worth traveling far for but if you are in the area do stop by. In some ways it feels as if Helsinki is becoming one of the more exciting coffee destinations, if not in Europe at least in the Nordics. Good life has been around for a while and has always been a solid option for a good cup of coffee. They used to offer a variety of mainly Nordic roasters and as such was a very interesting place to visit as the selection rotates. They are these days roasting themselves and doing it well but what is really great is that they still take some other roasters in occasionally to provide some variety. Good Life Coffee is located in the Kallio area in North Helsinki. The area as such is increasingly attracting a hipster crowd and of course Good Life Coffee is no different. It is still however pleasant and relaxed so I really like the vibe. It also has very friendly and knowledgeable service so always possible to have a nice chat with the staff. They are a great source for information on what goes on at the Helsinki coffee scene. The free WiFi also makes it a good place to sit for a bit longer. The quality of the coffee is consistently very high. I usually go for something hand-brewed but the espresso based beverages are also very nicely prepared. There are very nice pastries and cookies as well as breakfast and sandwiches. No real hot food but the stuff they have is good. There is also some very nice chocolate and locally produced juices. Located a few minutes walk away from Asok (take exit 6 for the smoothest walk). They are in a really pleasant and airy space and I can just see myself lounging for hours here be it morning, afternoon or evening (if my phone had not gotten legs in Singapore there would have been some nice pictures here as well) and the free WiFi also encourages lingering. They are much more than a cafe so rather an all day restaurant serving both food, cocktails, wine and coffee. They have a roaster on-site and they at least want to give the impression coffee is in focus here. Staff were friendly and English speaking but almost a bit shy or at least hesitant to chat. I did not manage to get a lot of information on the coffee but after a while settled for a french press on Kenyan beans. A bit disappointing presentation and execution, the French press arrived at my table, no instruction on how long to wait until to push down the press. A decent tasting coffee, not the best I had but not nearly the worst. No bitterness, but the other flavors a bit indistinct and blended together. I am looking for a cleaner cup and this was just ok not more. A macchiato was delivered and it was fairly well executed but not great. Would still opt for the milk based coffees here as it was better than the French press. No drip, Aeropress or such on offer which is a shame as it may have produced a better coffee from the variety of beans they had. Wine list looks promising and decently priced (cava at THB 295 a glass) and an extensive food menu. Really appreciated the scrambled eggs, fresh and well made so I think this would be more of a brunch spot than just a coffee place. Revolution coffee was one of the places on my list that I was doubting if I had the energy to visit. It was a bit off the beaten path but When I decided to go I found a very nice and tranquil location in an office complex in west Singapore. It is not too easy to get to but possible with public transport (MRT and free shuttle bus) but so much easier with taxi and with the affordable prices (if travelling a the right time of day) in Singapore I tend to prefer the ‘lazy’ option. The cafe has outdoor as well as indoor seating. Despite it being in office complex they have really managed to make it both cozy and comfortable. The relaxed feeling combined with the very friendly service makes me want to visit again and again. The guy running the place is very knowledgeable about coffee, willing to talk about it and generous with recommendations for other places. I am always skeptical of people who can never say anything good about any competitors so it is refreshing with someone who is confident enough in what they are doing to also recommend others. The fact that there is also free wifi and the relaxed environment really invites for lounging here. The food served is almost worth the trip in itself, lovely salads, pastas and sandwiches as well as some sweets as well. The kitchen really knows their stuff and the food is not that expensive either. The spicy stuff is however not very spicy so no need to ask them to hold back. We thoroughly enjoyed the food and they have a rotating selection of coffee, mainly from Singapore based roasters but occasionally one can also find other interesting stuff. When I was there they also had a lot from the US (Blue Bottle, Intelligentsia, SightGlass and a few others) in addition to coffee from the Tiny Roaster. The coffee served was very nicely prepared and out of the ones I tried one was excellent and the other was good. I had been ‘warned’ that the Colombian I was trying was a bit darker in the roast and that was true. It was still not bad but it had a bit more fullness than I would have liked and it overpowered some of the other flavors. Pacamara is one of several places to open up in the Upper Thomson Road area a North of central Singapore. The whole area seems to be buzzing with cool new places. Visiting on a Sunday it was also packed with people in search of a good brunch spot. Pacamara had a pretty nifty system for managing the queuing. One enters a phone number on a screen and how many people are in the group and then Pacamara calls when a table is available. The table will be held for 10 minutes after receiving the message, so you can browse around in the neighborhood while waiting. The service was however severely impacted by the place being full. They were slow to give out menus, things were sold out and they did not inform about it upfront. Food came out slowly and orders were mixed up. All in all not a great experience. Some of the people working there also seemed to have a little bit of the attitude that they are slightly too cool to actually work at a cafe and we were actually on one visit asked if we would mind to speed up a bit as they have many guests waiting – that was especially annoying since we then had just gotten the last of our food after a very long wait. The space is however very nice and bright, in a corner with big windows. There are mainly communal tables but it works fairly well and I must say that it looks really nice. There are a lot of seats, and while not super-comfy it is fine to sit for some time. There is also free wifi so on weekdays it may be a better bet if one wants to sit for long. The coffee was pretty disappointing. Not at all that bad but looking at a place that at least markets itself as a top roaster I was expecting more. The filter coffees sampled were a bit bland but no bitterness and smooth, but they had not managed to bring out the best in the coffees. I got much better results when brewing the same at home so perhaps more a flaw in the brewing. Still a good cup compare to the average cafe but nowhere near the better ones in Singapore. They were also out of several of the coffees that they had up on the board so that was also slightly disappointing. The espresso based coffees where however very nicely prepared. The food was however excellent. The truffled eggs Benedict is perhaps the best Eggs Benedict I have had. The pastries were tasty so the Kitchen know their stuff. It is a shame about the service and that the coffee quality is not top notch as the space is really nice and if they could up their game it would be a place I would visit again and again.